REGISTER FOR YOUR INTRODUCTORY WORKSHOP HERE! So you've checked out our website and feel spurred on, with this sudden surge of energy. Then perhaps you should make that important decision that would change your life entirely. Register with us and be in tuned with the healthy lifestyle you've been wanting to lead. It really doesn't matter if you haven't jogged in ages or find it difficult just walking to the bus stop – what's crucial is your decision. Once you've made that decision, we can help you kick start your way to an effective exercise program with individual advice and assistance. Before you join us, please spend about 3 minutes of your time to fill up our On-line Registration Form which incorporates a Physical Activity Readiness Questionnaire (PAR-Q) and Release form. It is with your best interests that we make sure you are medically fit to participate in our exercise programmes. Therefore we highly encourage members to consult with a medical practitioner if they have any past medical history. As a ACTIVE RED member, you will have access to our fitness classes and/or individualized exercise assessments and consultations. Do also take note that all members have to complete the PAR-Q every two years. I would like to register for Active Kickboxing Boot Camp. I would like to engage an Active Personal Trainer. I would like to consult a Nutrition Coach. If you have serious medical conditions, please seek your Doctor's approval. 1. Do you feel any discomfort in your chest when you do physical activity? 2. Do you experience dizziness engaging in strenuous activities? 3. Do you have a bone or joint problem that could be aggravated by a change in your physical activity? 4. Are you currently participating in any regular activity program designed to improve or maintain your physical fitness? If YES, what activity program do you participate in? If NO, do you know of any other reason why you should not do physical activity? Has a doctor or health professional ever told you that you have any of the following conditions? 4. Which best describes your current smoking status? I quit within the last 6 months. I quit more than 6 months ago. 5. How would you rate your overall state of health? I, hereby request the opportunity to participate in ACTIVE RED Fitness Programs consisting of physical exercise designed to improve cardiovascular efficiency, improve flexibility and develop muscular strength and endurance. I hereby acknowledge that my participation in such program is entirely voluntary on my part. My participation does not arise out or in the course of employment with ACTIVE RED and is not a requirement of any such employment. Such participation is solely for my own pleasure and benefit. I will be taught how to properly operate all equipment necessary for my participation. I realize that the physical fitness equipment provided can be potentially dangerous and that if I am unsure of the proper operation of any equipment, I should ask for assistance from the fitness staff. In addition, I understand that I should immediately cease using any malfunctioning equipment and report to the fitness staff equipment in need of repair. I recognize that exercise carries some risk to the musculoskeletal system (sprains, strains) and the cardiorespiratory system (dizziness, discomfort in breathing, heart attack). It is possible that certain unhealthy changes may occur during exercise (e.g., dizziness/fainting, abnormal heart rhythms, and in rare instances, heart attacks, and death). I hereby accept all risks of such changes. The information which is obtained through this program will be confidential and become a part of my ACTIVE RED medical records. The data obtained, however, may be used for statistical purposes. In consideration of acceptance of my participation in such program and understanding that I am personally responsible for my actions during my sessions with ACTIVE RED, I hereby release ACTIVE RED and all officers, directors, employees and agents (as a group and as individuals) of any of the foregoing for liability if I should incur any illness, injury or even death while participating in such a program as a result of my negligence. I have understood the terms and conditions to register myself for sessions with. 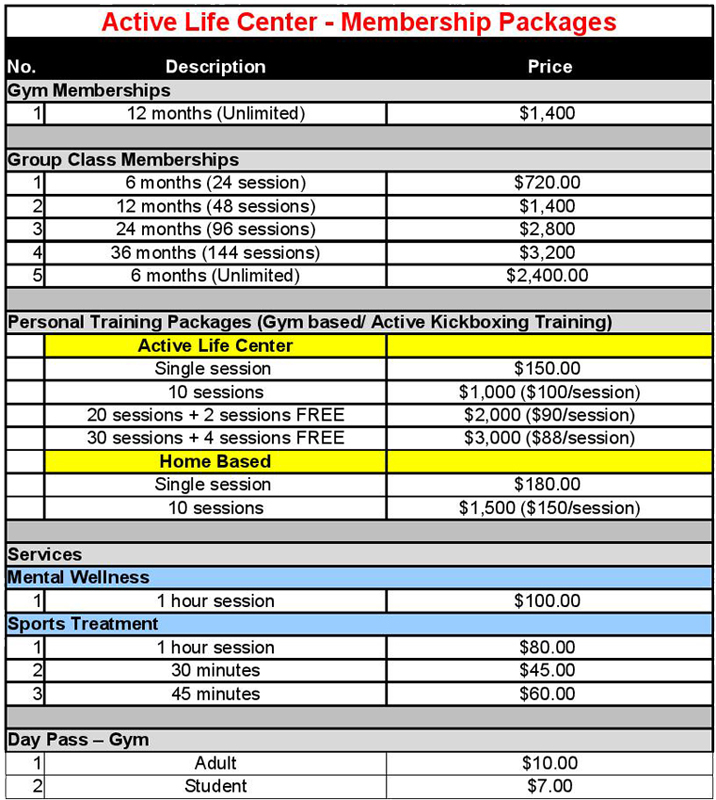 Experience Active Red's Kickboxing difference in a 1-hour introductory workshop at only $40 per session per person. When your sign up for our package, this fee will be waived off – your introductory workshop will be considered as the 1st session of your package (works out to be $22 per session for adult package). Introductory workshops are only held every Friday at 7pm. 1. We would like to advise that for safety reasons and to uphold the quality of our classes, all newcomers would need to go through an introductory class before you can book your slots in the regular timings. We DO NOT conduct theoretical introductory classes. All introductory classes are practical hands-on sessions. So GET READY TO SWEAT!!! 2. All students are kindly requested to book classes at least one week in advance and to inform us if you are unable to attend the class booked for. In such cases, please give us a minimum of 36 HRS cancellation notice if you are unable to attend the class. Last minute cancellations / no shows / late attendance will be considered as a session completed. 3. All students are kindly requested to phone in for advance bookings / cancellations of classes. Phone in bookings are necessary to guarantee students a confirmed slot in the class due to the growing number of students enrolled in our class. b. Active Kickboxing Personal Training valid for 3 months/10 weeks. 5. All students are kindly requested to arrive 10 mins prior to the commencement of the classes as all classes will commence on time – studio bookings are made by the hour. 6. Participation in the class will not be allowed 10 mins after the class has commenced. In such a situation, students will be doing it at their own risk. 7. All students are kindly requested to sign up for sessions at the beginning of the month or prior to the commencement of the sessions/packages purchased.